There is something about speaking with older people that has always captivated me even when I was a child. It's true that the more years a person adds to his life, he also gains more wisdom, stories to tell, experiences to share and practical advice to give. It's like shedding off what is unnecessary and just going back to basics, what's important and what is genuinely good. In Italy, one of my favorite topics in speaking with them is food. The advice they share sheds light to what was good hundreds of years ago (even before their time) and still good until now. It starts with the phrase "Once upon a time" when they want to speak about their favorite food when they were young, what their mothers or grandmothers used to prepare in the kitchen. I heard so many stories reminiscing about childhood, the food they ate and the aromas that they associate with them. Like once, we took home a loaf of bread that was prepared using the very old way and when my husband's Mom caught a whiff of it, she smiled and said that it reminded her of the smell of bread when she was young. Sicily is one of my favorite Italian regions to visit, not only for the beautiful places to see but also for the excellent food and wine that they produce. Oh, yes, also because my husband's family originated from there and we visit his relatives sometimes. When one of his aunts went to Sicily recently and asked us what we wanted from there, I only had a couple of wishes. 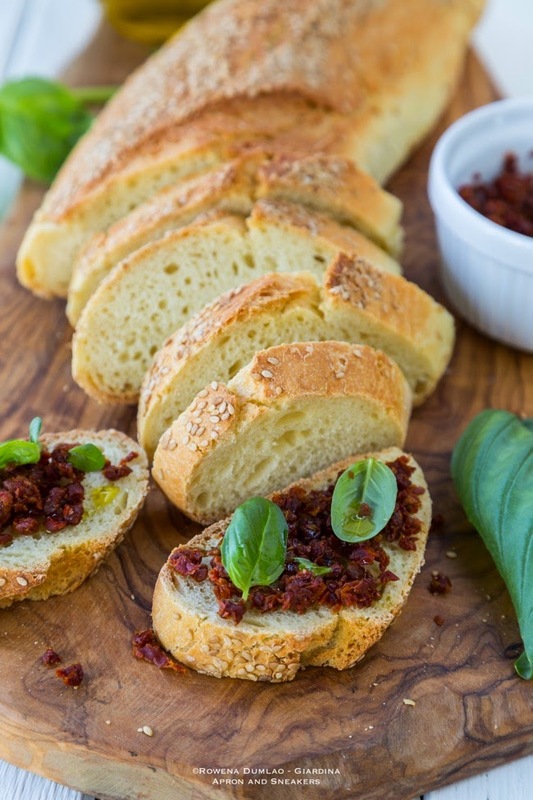 The local bread from their town and the ground sun-dried tomatoes called capuliatu. I swear, my appetite grew and grew until I finally had it on our kitchen table. And because it is not spring yet, it was even hard to find fresh basil leaves or plants. I am usually against off-season produce but at times you appreciate that they are there. 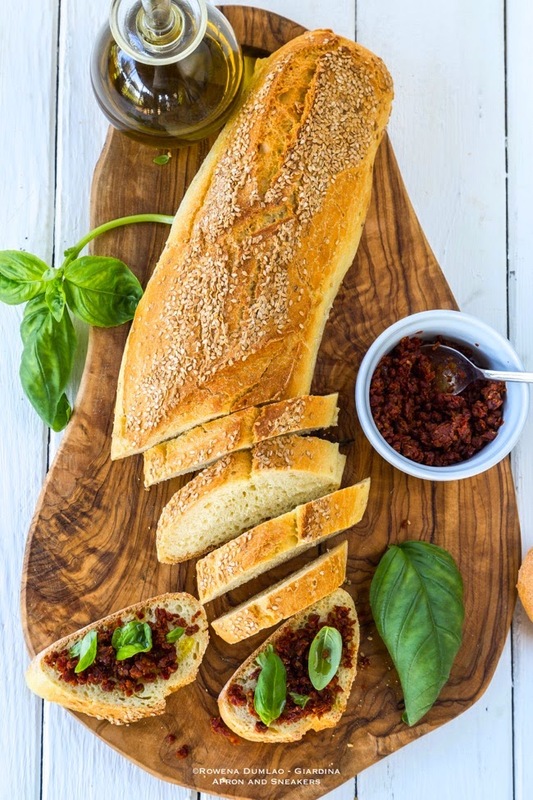 This very simple bruschetta is amazingly good when it is lightly toasted or sometimes, not even toasted, drizzled with extra virgin olive oil (has to be a good one), the capuliatu and fresh basil leaves. Toast the bread on a grill, griddle, saucepan or toaster. You can also go without toasting the bread. 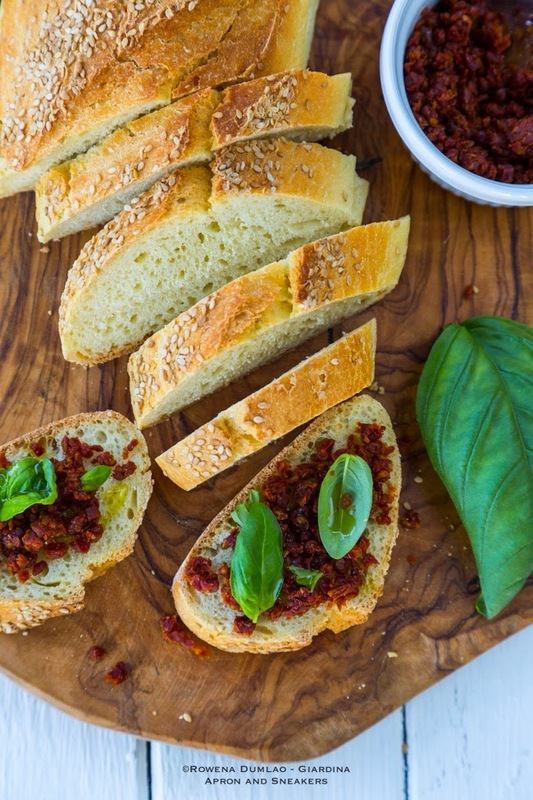 Drizzle the bread with extra virgin olive oil then sprinkle the capuliatu and basil.